Graduada em Ciências Meteorológicas (Universidad de la República, Uruguai, 2000), Mestre em Meteorologia (Stockholm University, Suécia, 2001), e Doutora em Ciências Ambientais Aplicadas (Stockholm University, 2008). Pós-doutorado na University of Leeds (Inglaterra, 2008-2009) e na Universidade Estadual de Londrina (Brasil, PR, 2010). Atualmente é Professor Adjunto do Instituto de Pesquisas Hidráulicas da UFRGS. 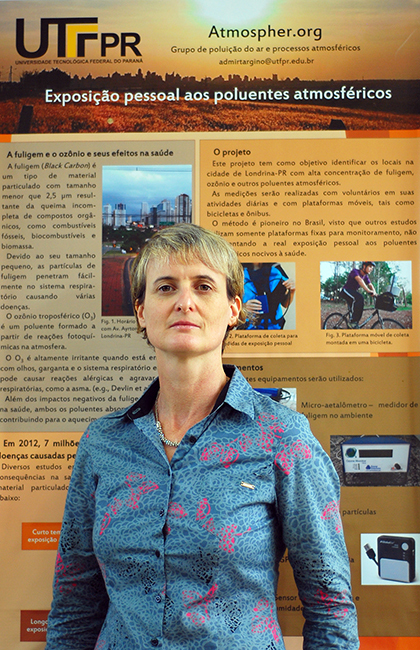 As principais áreas de pesquisa envolvem a caracterização físico-química dos poluentes atmosféricos em diversos ambientes (cânion urbano, rodovias, estações urbanas de fundo, rurais, queima de biomassa residencial) com especial ênfase no BLACK CARBON, identificação de fontes de emissão e a contribuição para o aerossol atmosférico, e aplicação de modelos atmosféricos em estudos da qualidade do ar. Gidhagen, L., Krecl, P., Targino, A.C., Polezer, G., Godoi, R.H.M., Castelhano, F., Felix, E., Cipoli, Y.A., Malucelli, F., Wolf, A., Alonso, M., Segersson, D., Amorim, J.H., Mendonça, F. Experimental and model assessment of PM2.5 and BC emissions and concentrations in a Brazilian city – the Curitiba case study. Atmos. Chem. Phys. Discuss., doi: 10.5194/acp-2018-1094, 2018. Targino, A.C., Krecl, P., Danziger Filho, J.E., Segura, J.F., Gibson, M.D. Spatial variability of on-bicycle black carbon concentrations in the megacity of São Paulo: A pilot study. Environmental Pollution, doi: 10.1016/j.envpol.2018.07.003, 2018. Targino, A.C., Coraiola, G.C., Krecl, P.Green or blue spaces? Assessment of the effectiveness and costs to mitigate the urban heat island in a Latin American city. Theoretical and Applied Climatology, doi: 10.1007/s00704-018-2534-1, 2018. Krecl, P., Targino, A.C., Landi, T.P., Ketzel, M. Determination of black carbon, PM2.5, particle number and NOx emission factors from roadside measurements and their implications for emission inventory development. Atmospheric Environment, 186, 229-240, 2018. Carvalho, A.M., Krecl, P., Targino, A.C. Variations in individuals’ exposure to black carbon particles during their daily activities: a screening study in Brazil. Environmental Science and Pollution Research, doi: 10.1007/s11356-018-2045-8, 2018. Pattinson, W., Targino, A.C., Gibson, M.D., Krecl, P., Cipoli, Y., Sá, V. Quantifying variation in occupational air pollution exposure within a small metropolitan region of Brazil. Atmospheric Environment, 182, 138-154, 2018. Targino, A.C.,Rodrigues, M.V.C, Krecl, P., Cipoli, Y.A., Ribeiro, J.P.M. Commuter exposure to black carbon particles on diesel buses, on bicycles and on foot: a case study in a Brazilian city. Environmental Science and Pollution Research, doi: 10.1007/s11356-017-0517-x, 2017. Krecl, P., Johansson, C., Targino, A.C., Ström, J., Burman, L. Trends in black carbon and size-resolved particle number concentrations and vehicle emission factors under real-world conditions. Atmospheric Environment, doi:10.1016/j.atmosenv.2017.06.036, 2017. Targino, A.C., Machado, B.L.F., Krecl, P. Concentrations and personal exposure to black carbon particles at airports and on commercial flights. Transportation Research Part D: Transport and Environment, 52, 128–138, 2017. Targino, A.C., Gibson, M.D., Krecl, P., Rodrigues, M.V.C., Santos, M.M., Corrêa, M.P. Hotspots of black carbon and PM2.5 in an urban area and relationships to traffic characteristics. Environmental Pollution, doi:10.1016/j.envpol.2016.07.027, 2016. Krecl, P., Targino, A.C., Wiese, L., Ketzel, M., Correa, M.P. Screening of short-lived climate pollutants in a street canyon in a mid-sized city in Brazil. Atmospheric Pollution Research, doi:10.1016/j.apr.2016.06.004, 2016. Targino, A.C., Krecl, P. Local and Regional Contributions to Black Carbon Aerosols in a Mid-Sized City in Southern Brazil. Aerosol and Air Quality Research, 16, 125-137, 2016. Krecl, P., Targino A. C., Johansson, C., Ström, J. Characterisation and Source Apportionment of Submicron Particle Number Size Distributions in a Busy Street Canyon. Aerosol and Air Quality Research, 15, 220-233, 2015. Krecl, P., Johansson, C., Ström, J., Lövenheim, B., Gallet, J. C. A feasibility study of mapping light-absorbing carbon using a taxi fleet as a mobile platform. Tellus B, doi:10.3402/v66.23533, 2014. Targino, A. C., Krecl, P., Coraiola, G. C. Effects of the atmospheric circulation on the onset and strength of urban heat islands: a case study. Theoretical and Applied Climatology, doi:10.1007/s00704-013-0989-7, 2013. 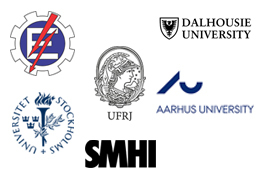 Targino, A. C., Krecl, P., Johansson, C., Swietlicki, E., Massling, A., Coraiola, G., C. and Lihavainen, H. Deterioration of air quality across Sweden due to transboundary agricultural burning emissions. Boreal Environment Research, 18, 19-36, 2013. Krecl, P., Targino, A. C., and Johansson, C. Spatiotemporal distribution of light-absorbing carbon and its relationship to other atmospheric pollutants in Stockholm. Atmospheric Chemistry and Physics, 11, 11553-11567, 2011. Allen, G., Coe, H., Clarke, A., Bretherton, C., Wood, R., Abel, S. J., Barrett, P., Brown, P., George, R., Freitag, S., McNaughton, C., Howell, S.,Shank, L., Kapustin, V., Brekhovskikh, V., Kleinman, L., Lee, Y.-N., Springston, S., Toniazzo, T., Krejci, R., Fochesatto, J., Shaw, G., Krecl, P. et al. South East Pacific atmospheric composition and variability sampled along 20 oS during VOCALS-REx. Atmospheric Chemistry and Physics, 11, 5237-5262, 2011. Krecl, P., Johansson, C., Ström, J. Spatiotemporal variability of light-absorbing carbon concentration in a residentia area impacted by woodsmoke. Journal of the Air & Waste Management Association, 60, 356-368, 2010. Sheesley, R. J., Krusa, M., Krecl, P., Johansson, C., Gustaffson, O. Source apportionment of elevated wintertime PAHs in a northern Swedish town by compound specific radiocarbon analysis. Atmospheric Chemistry and Physics, 9, 3347-3356, 2009. Krecl, P., Hedberg, E. L., Ström, J., Johansson, C. Contribution of residential wood combustion and other sources to hourly winter aerosol in Northern Sweden determined by positive matrix factorization. Atmospheric Chemistry and Physics, 8, 3639-3653, 2008. Krecl, P., Ström, J., Johansson, C. Diurnal variation of atmospheric aerosol during the wood combustion season in Northern Sweden. Atmospheric Environment, 42, 4113-4125, 2008. Krecl, P., Ström, J., Johansson, C. Carbon content of atmopsheric aerosols in a residential area during the wood combustion season in Sweden. Atmospheric Environment, 41, 6974-6985, 2007. Krecl, P., Harley, C. S., Stegman, J., Brohede, S. M., Berthet, G. Retriving the vertical distribution of stratospheric OClO from Odin/OSIRIS limb-scattered sunlight measurements. Atmospheric Chemistry and Physics, 6, 1879-1894, 2006.